I once had an upscale retirement home for a client. My job was to help the various units in the home work better as a team. During that year, I got to know the top management team. Towards the end of my assignment, the president decided to retire. This became the opportunity of a lifetime for the general manager, who had been grooming himself for that job for years. Unfortunately, he was not selected by the board for the job. A younger manager was promoted ahead of him, and the general manager resigned in anger. As far as I could determine, it wasn't because he was a poor manager or didn't understand the business. He had plenty of experience in these areas. No, it was because he was distant and abrasive with the staff. In other words, he had poor people skills. As everyone knows, the stock market tanked a few years ago when "the real estate bubble" burst. The market fell apart because a lot of high-level bank executives did the wrong things. The fact that the lack of regulation allowed them to do it is beside the point. They were inattentive, reckless, irresponsible, unscrupulous and disloyal to their bank's stakeholders. Untold numbers of inappropriate loans defaulted and hundreds of banks were in danger of going out of business. Many did, but President Obama and his advisers felt the biggest banks needed to be bailed out in order to prevent a depression. Plus, millions of lives were devastated by the effects of the downturn. This summary of what happened may be a little simplistic, but I think I got the gist of it right. The point is, like the retirement home general manager friend of mine, these guys really knew their business. They were highly educated, intelligent, and experienced in banking. But that wasn't enough to keep them from running their corporations into the ground and wrecking the American economy in the process. Their problem was that at their core, they lacked key personal strengths. They failed to do the hard things when it mattered. A lot like the thieves they try to protect their banks from, the lure of making some fast, easy money was too much for them. I've seen this scenario played out hundreds of times in every kind of organization at all levels, from supervisors to chairman of the board. It doesn't seem to matter who's involved. A person can have university degrees and years in the business, but if he or she has poor people skills or deficits of personal strength, none of this education or business acumen seems to matter. Bad things happen. Copyright © 2010, Performance Support Systems, Inc. In other words, when looking at an individual's abilities, employers are missing something. When conducting the interview, hiring the candidate, assigning the position, delivering the training, delegating the project or making the promotion, management is failing to take something crucial into account. 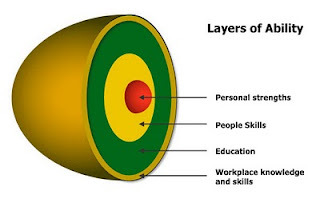 What they fail to give enough weight to is the core of a person's ability - their people skills and personal strengths. A person may know the business, but is he trustworthy? Does he take initiative? Does he strive for excellence? Does he persevere? And so on. At the core are several dozen personal strengths that enable a person to do the hard things - or not. And does the person listen well? Resolve conflict? Ask for and receive feedback? And a couple dozen other people skills? Depending on how much someone has had to strive in life, she may have developed some of the personal strengths. But most people don't have good people skills. Families, schools and the street have a way of teaching people the wrong things. And learning people skills is typically not a part of formal education. It's hard to overemphasize the significance of this shortfall in education and professional development. This is why ProStar Coach, my company's new online self-development system, is not only designed to reinforce skills introduced in training, it has an extensive online virtual gym for building personal strengths and people skills. When it comes to the abilities needed to succeed in life and work, personal strengths and people skills are at the core. Your parents didn't know this. Your coaches and mentors didn't know this. Your teachers and professors didn't know this. Even your managers and trainers didn't know this. But now YOU know this. Maybe you should tell someone. Or better yet, start working on building your own core strengths. People's perception of the world can really be costly. Feeling like fast is better, or riding people is more effective than encouraging. seem to regress rather than grow. I find it difficult to help him because unfortunately he believes he is better and smarter than me. Then seems to often be the case with those who hurt themselves and others. They are like mentally ill people who believe everyone else is the problem. They alone are the smart and savvy ones. Hi Mr Denny. I think it's good for all of us to uunderstand the value of education where character and knowledge were tought. I remember my vc's speeches, hé always emphasised that learning and character are the content of your certificate. So for us living in the developing country like Nigeria. Where we lack industrial skills due to in ability of govt and politics to industrialize our nation. In nigeria money talks.